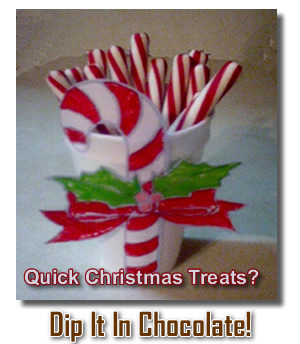 Quick and easy chocolate dipped candy canes are perfect for the Christmas season! It doesn't matter if you are looking for a last minute treat or you just happen to love the combination of peppermint sticks and chocolate - chocolate candy canes are an ideal solution. Candy canes on their own are very festive, of course, but presenting your guests with chocolate covered candy canes is even better. Chocolate covered candy canes are very easy to prepare, but they look gorgeous and taste even better. I love the idea of serving them to my guests with a hot drink so they can use their chocolate dipped candy canes to stir their coffee or cocoa and add an extra element of delicious delight to every sip. By the way, this is a particularly good recipe to let the kids help to make. It can provide you with a wonderful family tradition that will live in the hearts of your children forever. Melt chocolate chips and shortening in a double boiler over low heat, stirring until smooth. Remove from heat. The chocolate can also be melted in the microwave. Heat on medium high heat, stirring every 30 seconds until completely melted. Don't overheat! 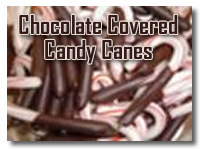 Dip candy canes in chocolate to coat. Place on wax paper covered tray to set. You may want to chill it in the fridge for 10-15 minutes. What could be simpler than dressing up these old favorites with a lovely chocolate coat? The wonderful combination of chocolate and peppermint flavors are pretty special. Your guests will thank you.